I have some leftover fried-pork-ball-with-five-spice-powder left in fridge.So in order to clean up all the leftover and vegetables,I incorporated all the ingredients cooked in earth claypot.One pot version,easy and simple! 1:Heat wok with oil at high heat.Toss in garlic and saute for 30 seconds. 2:Toss in meat ball ,vegetables and seasoning,mix well. 3:Prepare claypot at low heat,scoop all the ingredients in claypot.Pour in a cup hot water.Simmer at medium heat for 10 minutes.Cover with lid.Use a spatula to mix well. 4:Check the seasoning.Remove the claypot from heat.Serve warm. One of my favorite childhood is fried meat ball.I remember my mom like to make this dish when there is a festival or prayer offering.This dish is easy to prepare and needed only minimal ingredients.Fried meat ball is also suitable to serve as snack to children or adult alike. 1:Combined all seasoning ingredients,water chestnut and minced meat together in a big bowl,mix well. 2:Dip hands wet before scoop the meat mixture with a spoon onto your palm,roll into a small ball,set aside on a plate.Continue until all done. 3:Heat oil in fryer or stock pot at medium high heat about 360 F.Place the balls in the hot oil.Do not over crowded the fryer or pot.Fry minced balls for 10 minutes or until slightly golden brown. 4:Remove fried minced ball from fryer,placed on paper towel to dried the excess oil. 5:Serve warm with your favorite chili sauce. It's been awhile since I posted any new entry.No,I didn't abandon my beloved blog.Our summer vacation in Asia was over and now I have to go back to my daily routine. *crying* Since summer vacation until now I hardly cook at all until few days ago.All I do during our vacation was enjoying my mom's cooking or eating out.This petai dish is one of my mom delicious dish. Petai or stink beans is one of the popular dish in Malaysia.Mostly people cooked this stink bean or petai in spicy shrimp paste sauce with shrimp but my mom cooked this delicious dish with anchovies instead of shrimp.All those year, I never try to eat this stink beans until few years back.Friends told me that this type of stink beans is good for health .Once tried,I think it's acceptable.I like the crunchiness of the beans texture if it's cooked right.My mom said when buy petai/stink beans,try to get the petai from local instead of Thailand's petai.Local petai taste better and have the lesser chance of worms living in the pods. 1:Heat wok at high heat with oil,kaffir lime leaves and chili paste.Use spatula to keep stirring the paste until fragrant,about 15 minutes. 2:Toss in slices onion and petai,cooked for 2-3 minutes. 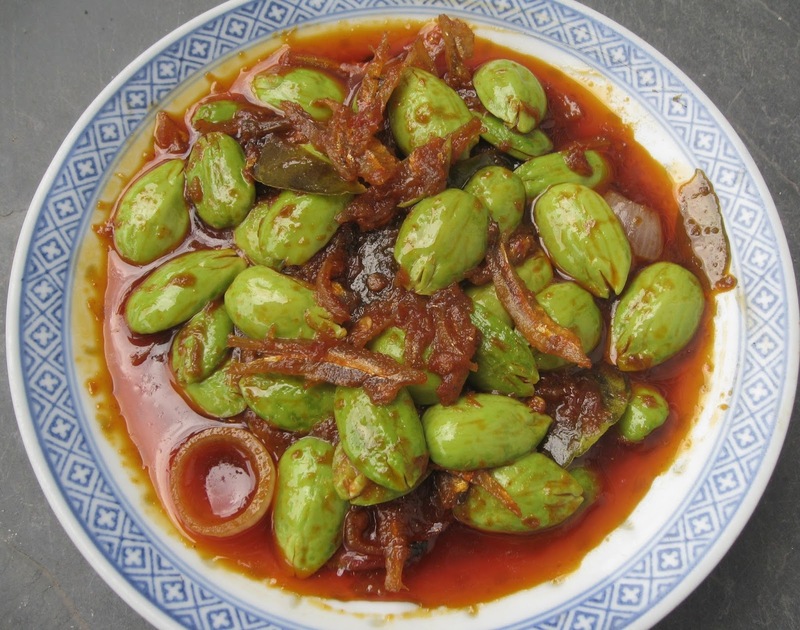 (do not over cooked petai)Keep petai crunchy. 3:Add in seasoning.Check the seasoning.Toss in fried anchovies and mix well. 4:Dish out and serve with steamed rice or noodles.